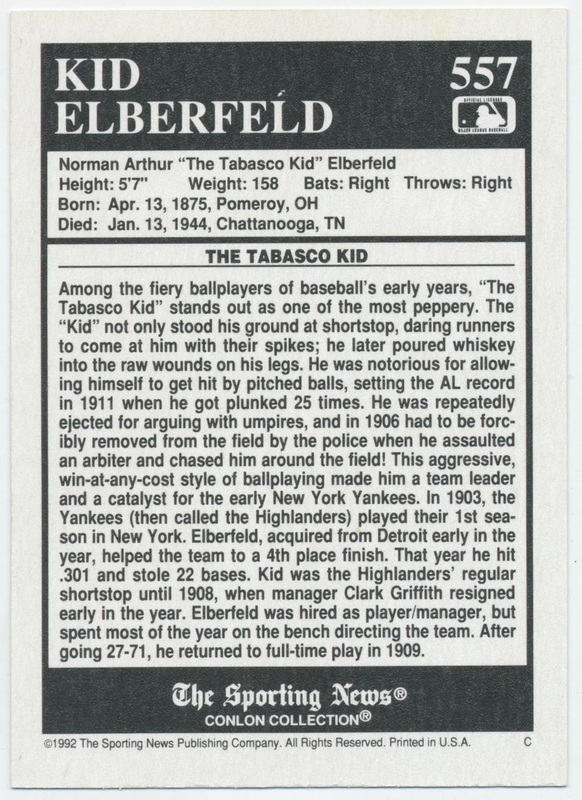 Dugout Legends: “THE TABASCO KID"
Who Will Be the Next Yankee Captain? Cecil Howell Travis - Shortstop - SUPER SENATOR! April 15, 1903. - Arizona Tombstone Epitaphs. July 16, 1903 - The Washington Post - BASEBALL CASE IN COURT. September 30, 1907 - The Worst Call Ever! Norman Arthur Elberfeld (Kid Elberfeld) Grave Stone, Chattanooga, TN. This site is "deep." The navigation bar at the left is just the beginning. For example, the "Time Line" gives access to hundreds of articles. Use the Search Box at the bottom of each page to help locate specific topics. Among the fiery ballplayers of baseball's early years, "The Tabasco Kid" stands out as one of the most peppery. The "Kid" not only stood his ground at shortstop, daring runners to come at him with their spikes; he later poured whiskey into the raw wounds on his legs. He was notorious for allowing himself to get hit by pitched balls, setting the AL record in 1911 when he got plunked 25 times. He was repeatedly ejected for arguing with umpires, and in 1906 had to be forcibly removed from the field by the police when he assaulted an arbiter and chased him around the field! This aggressive, win-at-any-cost style of ballplaying made him a team leader and a catalyst for the early New York Yankees. In 1903, the Yankees (then called the Highlanders) played their 1st season in New York. Elberfeld, acquired from Detroit early in the year, helped the team to a 4th place finish. That year he hit .301 and stole 22 bases. Kid was the Highlanders' regular shortstop until 1908, when manager Clark Griffith resigned early in the year. Elberfeld was hired as player/manager, but spent most of the year on the bench directing the team. After going 27-71, he returned to full-time play in 1909. ©1992 The Sporting News Publishing Company. All Rights Reserved. Printed in U.S.A. The 1992 Conlon TSN Baseball Card set consist of 330 cards numbered 331 - 660. The cards measure 2 1/2" x 3 1/2". 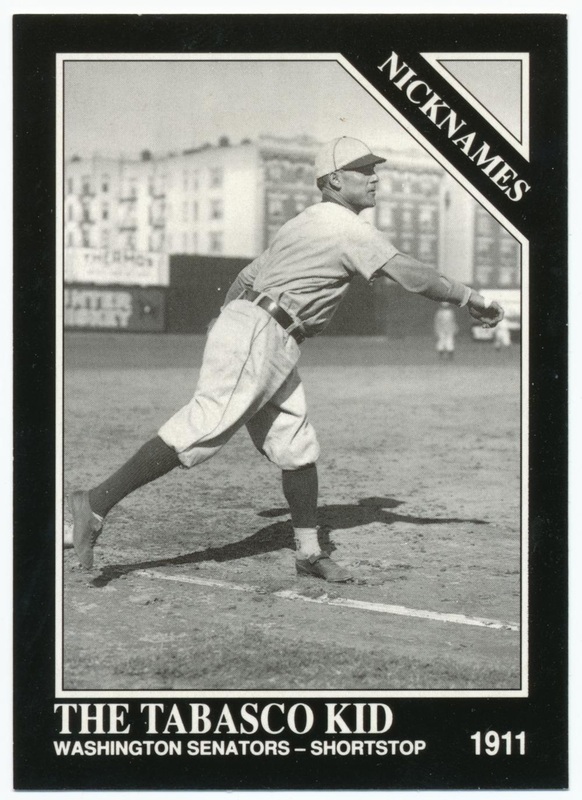 Produced by Megacards, who had a five year licensing agreement with The Sporting News, the cards feature photography from the Conlon Collection. This is the second series of a set that was issued in 5 separate installments from 1991 through 1995 totaling 1,430 cards. The Conlon Collection consist of 8,000 photographs that features the great work of photographer Charles M. Conlon. Notes: In 1839, around the time that Louis Daguerre announced that he had perfected the photographic process that would bear his name, the game of “base ball” was spreading up and down the Eastern Seaboard of the United States. By the turn of the 20th century, with the advent of the hand-held camera and the proliferation of newspapers and magazines featuring black-and-white photography, the sport was becoming the national pastime. Born in 1868, Charles M. Conlon was a proofreader at the New York Telegram when he began shooting pictures as a hobby. He started to frequent baseball stadiums in the first decade of the 1900s at the prompting of an editor. Using a Graflex camera, he soon filled the pages of the Telegram, as well as prestigious baseball publications including the Sporting News and the Spalding Guide, with evocative, intimate portraits. By the time he snapped his last picture, in the early 1940s, Conlon had become one of baseball’s foremost documentarians. Photography evolved radically and rapidly after Conlon's death in 1945. Camera, film and lens technology advanced, and color pictures became ubiquitous in glossy publications such as Sports Illustrated. The glass plates of Conlon and baseball’s other pioneering lensmen (including Louis Van Oeyen, Carl Horner and George Grantham Bain) were relegated to newspaper morgues. But Conlon’s work was rediscovered in 1990. The Sporting News, which had acquired the surviving glass negatives shot by Conlon, hired photo conservator Constance McCabe to print pictures from them. She told her brother Neal about them, and the Los Angeles-based baseball researcher found himself “blown away,” by both Conlon’s artistry and his anonymity. In 1993, the brother-sister duo published Baseball’s Golden Age: The Photographs of Charles M. Conlon (Harry Abrams). The book was a revelation, a time machine to the era of wooden ballparks, day games and legal spitballs. Golden Age was the visual equivalent of Lawrence Ritter’s Glory of Their Times, the groundbreaking oral history of professional baseball’s early days. Roger Angell, the New Yorker’s longtime staff writer, has called it “the best book of baseball photographs ever published.” Nearly two decades later, Neal and Constance McCabe have teamed on a second volume. 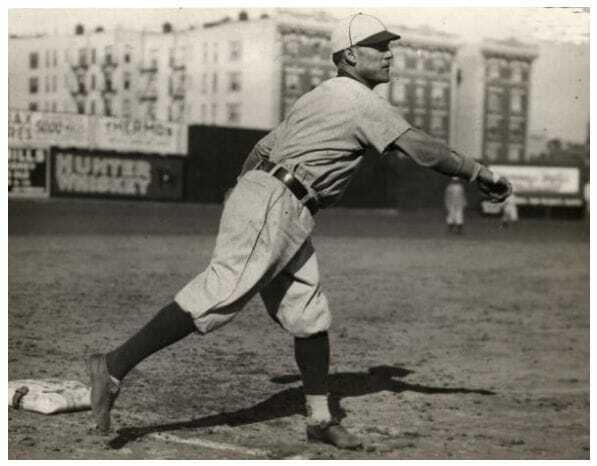 The Big Show: Charles M. Conlon’s Golden Age Baseball Photographs (Abrams). Published to mark the 125th anniversary of the Sporting News’ first issue, it is the rare sequel that may trump the original. The stars—Babe Ruth, Walter Johnson, Bob Feller—are well represented, but there’s plenty of space for the likes of Walt Cruise, George McQuinn and Paul Krichell. Their careers were forgettable, but their likenesses, as seen through Conlon’s lens, are not.